The UK is experiencing an "equine overpopulation crisis" with thousands of horses in desperate need of help, the British Horse Society has said. 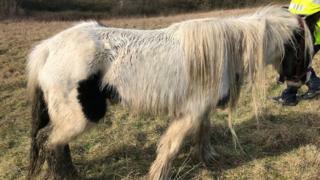 The warning comes after eight horses were dumped in Nottinghamshire within a month, including one which died after it was thrown out of a trailer. The society said people were acquiring horses cheaply or for free, without understanding the expense of care. The government said it had strengthened protections for horses in new laws. Gemma Stanford, director of welfare at the society, said UK rescue centres could not cope with the "rising numbers" of horses needing care. "The UK is currently suffering an equine overpopulation crisis, with thousands of horses in desperate need of care," she said. The RSPCA, which rescued about 1,000 horses in England and Wales in 2017, said it received about 80 calls a day on its cruelty line. An attempt to abandon a horse in Pinxton Lane on 7 March led to the police being called, after the landowner was harassed by a gang of men. Horses for Friends, which has been helping rescue the animals, said it was "shocking to come across a dead or dying horse" and it had held a support meeting in Kirkby-in-Ashfield on Tuesday. "[Dumping horses] is devastating because it's done without remorse, to starve an animal, to leave it in pain and fear," a spokesman said.